We started with a plan: Find the best pulled pork in Spokane. We assumed this would be a classic Americana cook-off, with straightforward flavors and plenty of barbecue sauce oozing between our fingers. We figured our job would be easy: Find the best bun, the best meat, and the best sauce. Dock the cook whose bun went soggy or whose meat arrived dry. Tally up the points, proclaim a winner, and walk away … to the gym, to work off the accumulation of seven sandwiches eaten in just over 24 hours. In reality, our hunt for the best pork took us south of the border, to the Korean peninsula and into the heart of the Mediterranean — not to mention side trips to Texas and South Carolina, with seven kitchens taking seven radically different regional spins on the pork sandwich. Fuss all you want about Spokane’s monochromatic culture. Our kitchens are diversifying, as the humble pig is (un)happy to point out. WHO: Two judges. Both men. Neither vegetarian. Kevin Finch. Luke Baumgarten. WHAT: Seven sandwiches. No Idaho entries. All from places getting good pork buzz. SCORING: Categories for quality of the meat, bun and sauce, with a final for the sandwich’s overall impact. Simply eat lunch at Italia Trattoria, Ha Ha Grill House or the deli at De Leon’s Foods, and you’ll be forced to abandon the assumption that America has the corner on pulled pork. All three serve up impressive and radically different sandwiches. Italia’s version fancies up the basic shredded pork with slices of both ham (pork in another form) and provolone before topping it with lettuce, tomatoes and a smear of lemony aioli. Ha Ha serves up a sandwich that looks Southern until you take a bite and find not just caramelized onions, but a sauce laced with cinnamon, fruit and herbs that typically don’t have names in English. De Leon’s tortas de carnitas adds refried beans, crema, lettuce, tomato and a dusting of aged Mexican cheese for a glorious mess wrapped in tinfoil. What comes to mind for most of us when someone suggests a pork sandwich is the classic Southern specialty featuring shredded or sliced pork, barbecue sauce and a soft bun. 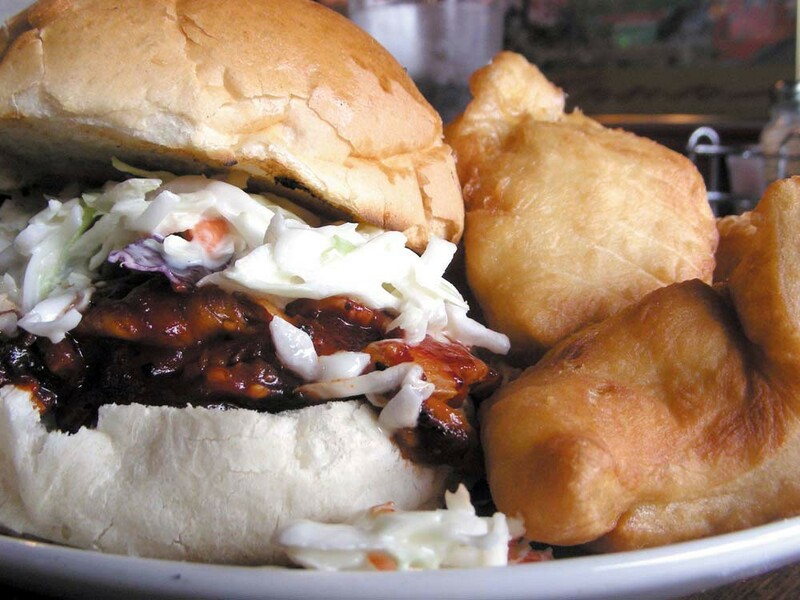 Depending on the state of origin, this classic may or may not also include a mound of coleslaw under the bun. O’Doherty’s Irish Pub in the Valley — that collision of an Irish drinking establishment and a barbecue joint — serves its pulled pork straight: no slaw and a sweet sauce. The Red Lion BBQ and Pub has two separate sandwiches on the menu: one with slaw and one without. We liked the proportions on the pork-and-slaw option. Hill’s and Chicken-N-More offer slaw as a possible side so you can make the call. At Chicken-N-More, the slaw is a great counterpoint to the heat, spice and vinegar of Hemphill’s sauce. The strength of Hill’s sandwich allows it to shine with or without slaw. ITALIA TRATTORIA 144 S. Cannon St.
Award The Dainty Eater Award for the least messy sandwich. DE LEON FOODS 102 E. Francis Ave.
HA HA'S GRILL HOUSE 2710 E. Garland Ave. Sauce A wonderfully complex Korean barbecue sauce that includes apple, Korean pear and pineapple as well as a number of Korean herbs you won’t find at the supermarket (and probably don’t have English names). Side Options Plenty of options, but don’t miss the fry bread. HILL'S RESTAURANT & LOUNGE 401 W. Main Ave. Sauce A balanced barbecue sauce with spicy and savory notes that didn’t overpower the pork. CHICKEN-N-MORE 414 W. Sprague Ave.